This is a device that every drummer must have. 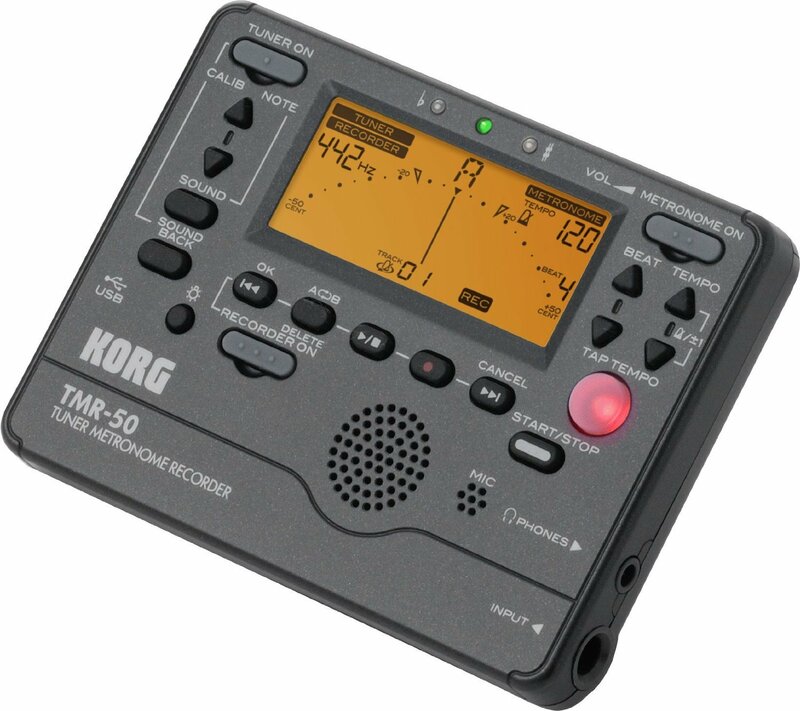 I believe that a drummer who did not practice with a metronome does not understand how much this gadget improves overall playing (read timing). It is a must have device especially, when you walk into the studio to record your song. There is no audio designer who will be able to fit you with the rest of the band if you do not use the metronome. So we looked for the affordable, user-friendly, resistant, nicely designed metronome. A metronome is a device that produces sounding beats or ticks per minute so as to keep a drummer in correct time. The metronome is most helpful as a coaching tool for any drummer learning the way to keep the correct tempo. Depending on the style of music, it's going to require a rise or decrease in tempo. The device also encourages additional development of user’s internal sense of tempo. This means that a drummer learns to recognize the tempo while not having to depend on the metronome indefinitely. The metronome assists you throughout practice and improves your ability by keeping you on point with reference to the appropriate tempo. However, it should be easy enough to turn it off or stop once it's no longer needed. There is no need to invest large amounts of money on one thing that is packed with bell and whistle sounds. However, drummers who have trouble keeping time will like an electronic metronome's ability to store various tempos for practice. Some of the most effective electronic metronomes provide the programming of custom beats, which is significantly handy if you are a drummer who wants to take a composition to the next level. Some metronomes can discover pitch differences. That is useful in case you want to tune your drum properly during practice or rehearsal. There are 2 major kinds of a metronome: mechanical and electronic. The mechanical metronomes have adjustable weight at the end of the reversed pendulum that flips back and forth to keep the tempo constant. These devices have an internal element that produces a clicking noise as the pendulum swings to every beat. The electronic metronome is usually battery-operated with a digital display that uses a quartz crystal to keep up its accuracy. Many electronic metronomes have inbuilt dials or buttons to manage the tempo, while others will produce many distinct sounds to represent totally different beats. 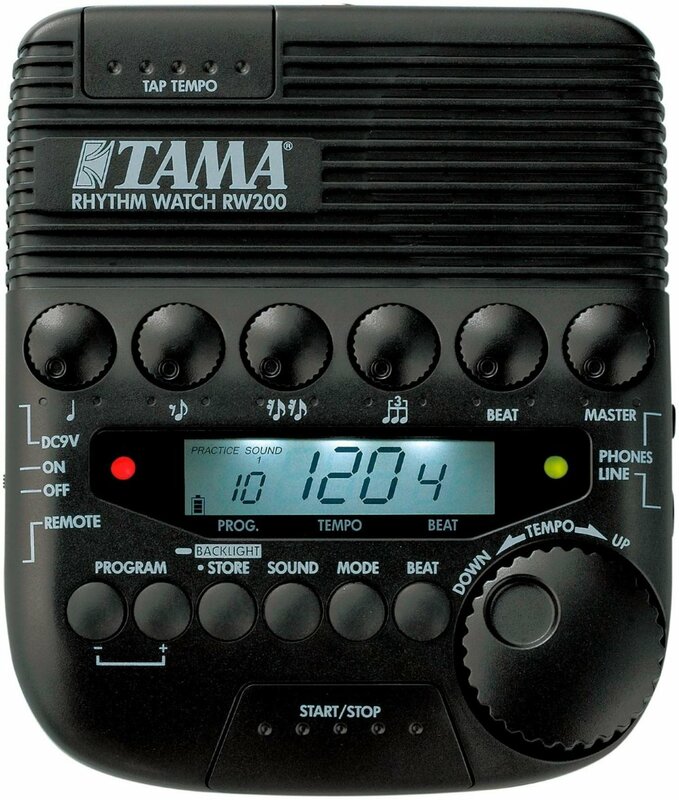 Designed especially for drummers, the Tama Rhythm Watch RW 200 could be a great choice that combines practicality with a decent value. The Rhythm Watch has been around for a long time, and most drummers would tell you it’s an excellent product. Recently the device has passed through a slight redesign and has been greatly improved. Programmable options include a button that allows you to maneuver up and down between saved tempos. In addition, there's a 1/4″ and 1/8″ headphone jack and also the programmable memory is larger. The tempo vary is from 30-250bpm. The Rhythm Watch features enough customizability which makes it worth buying. All subdivisions volumes can be modified using their own dials, you can save tempos, and there are a couple of different sound choices offered. Tama rhythm watch is powered by a 9-volt battery, however, may also be plugged in with a 9V power adapter that isn't included. You can additionally purchase an L-rod if you would like it to be mounted on a cymbal stand. Easy to spin tempo dial. The comparatively good value given the options offered. The mounting system requires extra purchases. This metronome combines 3 functions that make the playing in right time and in right pitch, an easy task. This model offers you to record and playback your performance to determine if you are making progress. You can do the recording and playback using the internal microphone and speaker. Another feature that makes the KORG TMR50BK a great choice is the Loop Play Functionality. Loop play allows you to playback the desired region of a particular recorded track. You can also record up to 100 tracks using the high-quality linear PCM record/playback functionality and later, you can transfer your recorded tracks to and from the TMR50BK through the USB port connectivity. Also, you can produce a reference tone using the Sound Out function. The reference tone can be created directly from the built-in speaker, so you can easily tune your instrument. It has a sporty and appealing design that makes fun to use. For musicians or aspiring drummers looking to take their career to the next level, the DB-30C offers a plenty of interesting features that defies its compact size. 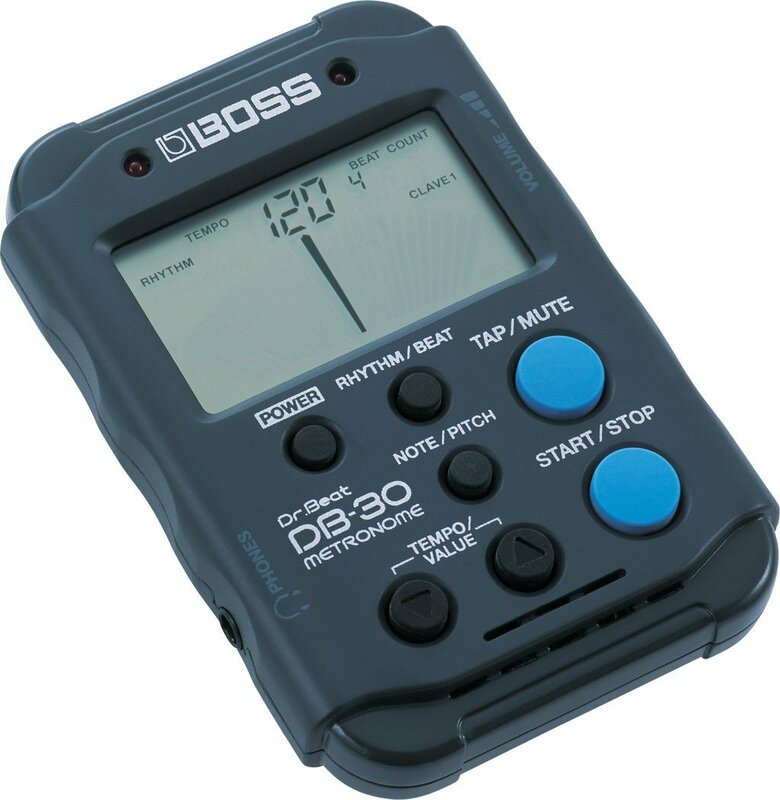 The Boss DB-30C is a cheap metronome that has the capacity to create different types and styles of rhythmic patterns, as well as the time comfortable to practice along with the built-in patterns. Apart from the fabulous pattern creation ability, the Boss DB-30C Dr. Beat metronome has the ability to get you out of a complicated rhythmic pattern. With it, you can have better timing plus it is simple to use, the beginner drummer can use it at first contact without need any user guide. The device is especially helpful for people who are learning the drums because you can easily adjust the volume, time signature and beat settings that are extremely user-friendly. Headphone output jack with volume control is an extra plus. It has the ability to turn itself off when not used anymore. And remember cheap doesn't always means bad, this is definitely good product for the money. The most expensive option of all these metronomes I have mentioned, for those with a deep pocket, is this product. I've read somewhere that this is a "Cadillac" among metronomes. Every feature is adjustable: subdivisions, programmable time signatures, clave patterns, sounds. If you are a trying to play among a composition with multiple tempo changes in it, it is possible to program in all of those changes to help you practice. The DB-90 features an internal microphone. With it, you can record your own snare, hi-hat, drumstick or any other component, and use it as the metronome sound. It also includes a built-in rhythm coach which helps you maintain timing. 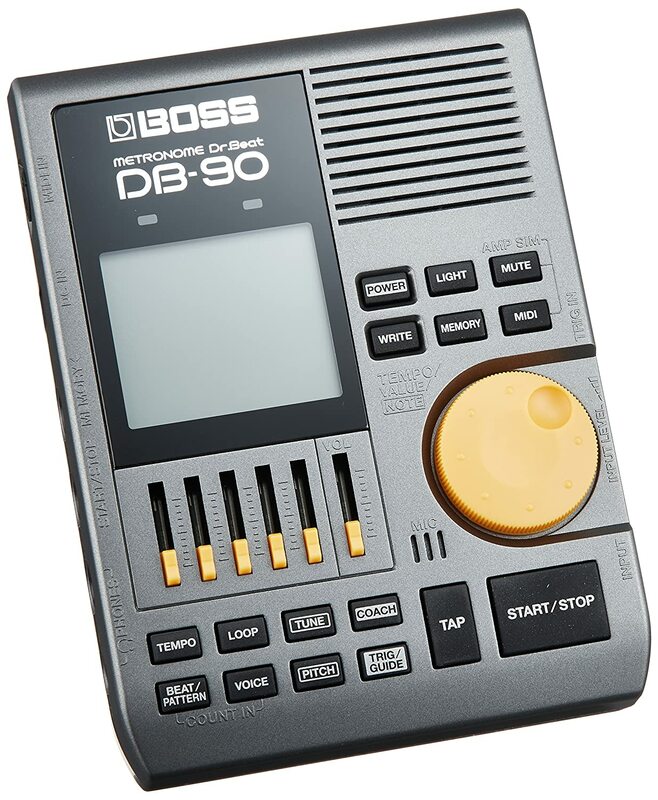 The DB-90 metronome is powered by a 9-volt battery, which will last a decent amount of time. You can also plug it in using an AC/DC adaptor but you will have to buy one separately because it is not included. Mountable on a cymbal or microphone stand. Midi and quarter inch inputs. Internal microphone and built-in rhythm coach program. Little documentation on how to use all features. Metronome should be the best companion to every drummer, so do not save money on it. A good metronome is worth every penny.